The effort of Japanese Prime Minister Shinzo Abe to emasculate and revise the country’s war-renouncing constitution encountered a mass protest on Sunday, the country’s 68th Constitution Memorial Day, when he returned from the United States with the updated bilateral defense guidelines that will result in unconstitutional revision of security-related legislation. Abe and his ruling Liberal Democratic Party is mulling to hold a referendum in 2017 to realize the first-ever amendment of the country’s supreme law, and is seeking to start discussions with other political parties as early as possible to carry out the amending procedure at an early date. However, the prime minister has reinterpreted that war- renouncing constitution last July to give the green light to the Self-Defense Forces (SDF) to exercise the right to collective defense, allowing the SDF to engage combat overseas, which goes against the constitution that bans the SDF to fight outside Japan. In line with the updated defense guidelines, Abe said he will try to achieve the revision of a series of security-related laws so as to legalize the exercise of the right to self-defense, even before the amendment of the pacifist constitution. Kenzaburo Oe, a Japanese Nobel literature laureate, said during a pro-constitution gathering of some 30,000 people on Sunday that Abe lied when addressing a joint session in the U.S. Congress. He said the prime minister hawked the idea around to foreigners that it is for fighting together with the United States that Japan approved for the SDF to exercise the right to collective defense and adopted unconstitutional revision of security-related legislation. But back in Japan, he has made no explanation to the Japanese people and failed to get public support, Oe said. The major figure in contemporary Japanese literature urged the Japanese people to protect the pacifist constitution and to oppose any legislation that may lead to war. Yoichi Higuchi, a constitutional expert, also slashed the Abe administration, saying Abe is putting the Japanese people’s right to existence at risk by allowing the SDF to exercise the right to collective defense. He called on the Japanese people to stop Abe’s coup against the constitution. According to a latest nationwide poll conducted by Japan’s mainstream daily the Asahi Shimbun, 48 percent of the respondents oppose the amendment to the constitution as advocated by Abe, while 43 percent of them support the revision. 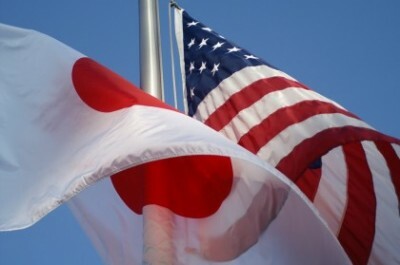 The survey result released on Friday also showed that 63 percent of the surveyed expressed opposition against the revision of Article 9 of the pacifist constitution that bans Japan to use force overseas, while only 23 percent said they agree to lift the ban on the SDF. In Yokohama, the demonstrators also protested against a Japan-U. S. agreement to relocate the U.S. Futenma airbase within Japan’s Okinawa Prefecture as Abe and U.S. President Barack Obama had reaffirmed the plan during their summit in Washington, despite Okinawan’s public desire for moving the airbase outside the island prefecture.